Kirie Goshima is an ordinary high school girl in the coastal town of Kurōzu-cho. She’s dating Shuichi Saito, an old friend who used to go to school with her in the town but ended up attending an out-of-town high school. One day, as Shuichi returns home for a visit, Kirie becomes aware that Shuichi’s dad has become obsessed with the symbol of the spiral. 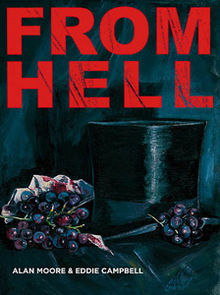 This apparently harmless aesthetic obsession runs out of control until Mr. Saito dies in a gruesome and nigh-impossible fashion; as his ashes spiral into the sky from the town crematorium, Mrs. Saito succumbs to a phobia of spirals just as acute as her late husband’s obsession, with equally grim consequences. 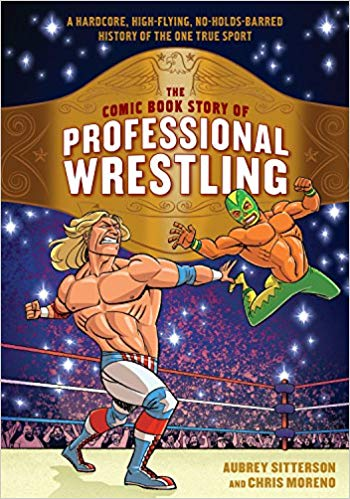 Written by Aubrey Sitterson, host of the Straight Shoot podcast, and illustrated by Chris Moreno, The Comic Book Story of Professional Wrestling is an almost 200 page history of what the book calls the One True Sport. This is a title Sitterson bestows because of, not despite, the fakery intrinsic to the format, which he makes a case for being a strength of the form rather than a liability. Clueless non-fans love to point out to wrestling fans that it’s fake, as though any wrestling fan didn’t know that. (Despite fan myth suggesting that “kayfabe” – the pretence of reality – died in the 1990s, the history notes that actually the lid was blown off the business by a renegade promoter airing his grievances in the press back in the 1930s.) What they don’t get is that the fakery liberates wrestling from any consideration aside from providing an entertaining spectacle and emotionally engaging stories to the audience. Football teams, athletes, and so on are supposed to be concentrating on winning first and foremost, entertainment second; Vince McMahon’s infamous “sports entertainment” phrase really sums up how wrestling inverts that, since it’s an entertainment which uses the trappings of sport as its aesthetic and premise. To my eye the length of the book is just about right; it’s short enough to provide a good introduction to the field that isn’t off-putting in its length but long enough to be meaty and go into sufficient detail that it can also teach fans a thing or two. Sitterson has a knack for condensing his text down to a point where he’s delivering a lot of information in a short amount of text without becoming so terse that he fails to adequately explain crucial concepts; Moreno’s artwork not only fits the superheroic world of wrestling neatly but also works well to support and convey Sitterson’s points. Note: Ferretnibbles 4 is not conserved here since it was not my own work. 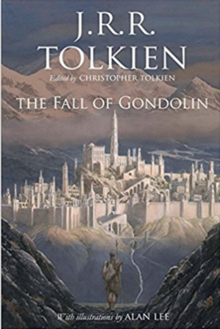 The Fall of Gondolin is the third of Christopher Tolkien’s standalone presentations of major narratives from Middle Earth’s First Age, following on from The Children of Húrin and Beren and Lúthien. Since he’d hit his early 90s by the time the latter volume was done, Christopher had played down the hopes of his being able to complete this one, but thankfully he has been able to; this time around, he’s much more emphatic that this is well and truly the end of the line as far as his delvings into his father’s Middle Earth manuscripts go. The three stories in this trilogy constitute the three stories which J.R.R. Tolkien himself thought could sustain an entire novel by themselves, and in each case he made multiple concerted attempts to set down and revise the narrative to a point he was happy with, but all were unfinished to a greater or lesser extent. As I’ve previously detailed, The Children of Húrin is presented mostly as a single, continuous narrative, Christopher Tolkien taking the most complete version of the narrative available and then drawing on other texts to patch over the gaps here and there. On the other hand, in the case of Beren and Lúthien no one version of that narrative was developed and polished to the point where that was possible, so Christopher instead presents the different versions of the texts in order of composition so readers can trace how the story developed from its early, Lord Dunsany-esque prototype into more distinctly Tolkien-ish later forms. Webcomics are great when they’re not terrible, and two of the most consistently not-terrible webcomic creators of recent years have been Andrew Clark of Nedroid Picture Gallery fame and the much-memed K.C. Green, creator of series like Gunshow and He Is a Good Boy, with breakout hits including that doggo who doesn’t think things are all that bad, Anime Club and the comic which inspired the “magical realm” meme. But do these two great tastes taste great together? Luckily, a recent Kickstarter of theirs lets me offer the answer in Kickstopper form. The format of a Kickstopper goes like this: first, I talk about the crowdfunding campaign period itself, then I note what level I backed at and give the lowdown on how the actual delivery process went. Then, I review what I’ve received as a result of the Kickstarter and see if I like what my money has enabled. Lots of Kickstarters present a list of backers as part of the final product; where this is the case, the “Name, DNA and Fingerprints” section notes whether I’m embarrassed by my association with the product. Towards the end of the review, I’ll be giving a judgement based on my personal rating system for Kickstarters. Higher means that I wish I’d bid at a higher reward level, a sign that I loved more or less everything I got from the campaign and regret not getting more stuff. Lower means that whilst I did get stuff that I liked out of the campaign, I would have probably been satisfied with one of the lower reward levels. Just Right means I feel that I backed at just the right level to get everything I wanted, whilst Just Wrong means that I regret being entangled in this mess and wish I’d never backed the project in the first place. After that, I give my judgement on whether I’d back another project run by the same parties involved, and give final thoughts on the whole deal. So, now that we’ve taken a look at The Starry Wisdom and its Alan Moore-flavoured inclusion, the short prose story The Courtyard, we can now put Moore’s latter-day forays into Mythos fiction under the microscope. 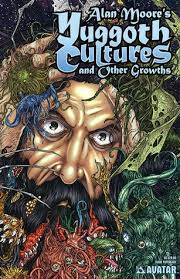 These have largely taken place with the aid and encouragement of Avatar Press; first there was the limited series Alan Moore’s Yuggoth Cultures, collected into a trade paperback of the same name, which covered a mixture of archival Mythos and non-Mythos works by Moore, as well as some work not by Moore at all thrown in for the sake of the ride; then there was a comic book adaptation of The Courtyard, then a graphic novel sequel (Neonomicon), until finally and most recently Moore has treated us to a three-act graphic novel sequence collected in three trade paperbacks, entitled Providence. Over the course of these he develops a range of ideas about the Mythos – but does he really manage to grow beyond the kernel of a concept offered in The Courtyard’s original appearance? Well… let’s see. The title of this implies far more conceptual unity than it actually possesses. Yuggoth Cultures and Other Growths was originally conceived by Moore as a full collection of Cthulhu Mythos works, but Moore lost most of the manuscript in a London taxi. The most substantial of the surviving pieces was The Courtyard, originally intended for being adapted here until it was spun out into its own adaptation, whilst the other scraps – Zaman’s Hill and Recognition – were brief poems.